Founded in 1947, Tokyo-based Mitsui & Co., Ltd. (OTCMKTS:MITSY) (TYO:8031) is one of the world's most diversified trading, investment and services enterprises. 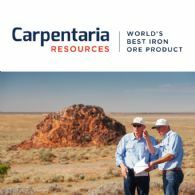 The company is a leading exporter of natural resources and agricultural commodities from Australia, accounting for around $8 billion in total exports annually as the nation's fourth largest exporter. In the past decade, Mitsui group companies have invested around $15 billion in Australia, backed by its network of 137 offices in 66 countries/regions. 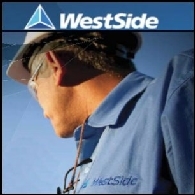 WestSide Corporation Limited (ASX:WCL) are pleased to provide a Shareholder Newsletter - Quarterly Activities Report for the period ending 30 June 2012. 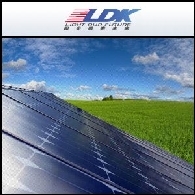 Asian Activities Report for January 4, 2012 includes: LDK Solar Co., Ltd. (NYSE:LDK) has agreed to acquire approximately 33% increased share capital in Sunways AG (ETR:SWW) and has also offered to takeover all outstanding shares in Sunways; Mitsui & Co., Ltd. (TYO:8031) says that its joint venture company Galaxy NewSpring Pte. Ltd. will operate two new water treatment plants in China; Nomura Holdings, Inc. (TYO:8604) has reached an agreement to invest in Jiu You Quan Xing Equity Investment Fund, a private equity fund based in Shanghai; Diploma Group Limited (ASX:DGX) has achieved Practical Completion on its Eleven 78 development on Hay Street in West Perth; AEON CO., LTD. (TYO:8267) announced that its subsidiary, Petcity Co., Ltd. will be merging with AHB International Inc..
WestSide Corporation Limited (ASX:WCL) provides an audio interview where Company CEO Julie Beeby discusses: September quarter production at Meridian SeamGas and outlook, Galilee Basin exploration plans, and funding position post Mitsui E&P farm-in. 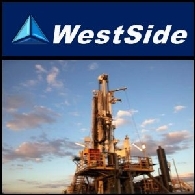 Meridian SeamGas operator WestSide Corporation Limited (ASX:WCL) is pleased to announce a 93 per cent increase in total Proved and Probable (2P) reserves attributable to the joint venture, based on results from the first stage of its reserves expansion program. 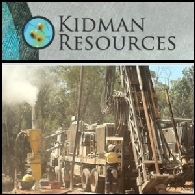 Asian Activities Report for July 8, 2011 includes: Kidman Resources Limited (ASX:KDR) discovered a new high grade copper lode at the Blind Calf Prospect in central NSW; Transit Holdings Limited (ASX:TRH) announced an increase in grade and tonnage at the Paradox Basin Potash Project in USA; Amex Resources Limited (ASX:AXZ) has exercised its option at Lautoka Port for a 45 year lease; Mitsui & Co., Ltd. (TYO:8031) will acquire a 49% participating interest in the Woori coal project from Cockatoo Coal Limited (ASX:COK) for A$37.25 million. 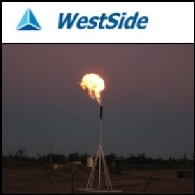 WestSide Corporation Limited (ASX:WCL) is pleased to advise that Mitsui E&P Australia Pty Ltd (Mitsui) has today executed farm-in agreements to acquire 49 per cent of the Company&apos;s 50 per cent interests in Bowen Basin tenements ATP 688P and ATP 769P. 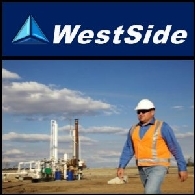 WestSide Corporation Limited (ASX:WCL) is pleased to advise that Mitsui E&P Australia Pty Ltd (Mitsui) has today executed farm-in agreements with WestSide to acquire a 49 per cent interest in each of the Company&apos;s Galilee Basin tenements, ATP 974P and ATP 978P. 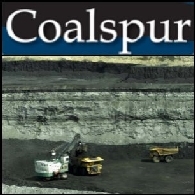 Coalspur Mines Limited (ASX:CPL) (PINK:CSPZF) (TSE:CPT) is pleased to announce a Coal Resource upgrade of 87.2 million tonnes on Vista. This increases the Company&apos;s total Coal Resource to 1.46 billion tonnes. 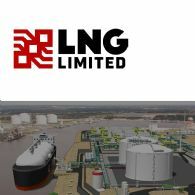 Asian Activities Report for May 4, 2011 includes: Liquefied Natural Gas Limited (ASX:LNG) has executed a Share Placement Agreement with a wholly owned subsidiary of China National Petroleum Corporation; Tap Oil Limited (ASX:TAP) has agreed to sell a 25% interest in the WA-351-P exploration permit in Western Australia to Japan Australia LNG Pty Ltd; Orocobre Limited (ASX:ORE) (TSE:ORL) announced the results of its definitive Feasibility Study of the Salar de Olaroz lithium-potash brine project in Argentina; AusQuest Limited (ASX:AQD) is undertaking major drilling programs to test priority gold prospects at Comoe Project in Burkina Faso.